Audi has introduced its new e-tron, which it claims is an SUV with three different methods of energy recuperation combined in a single vehicle for the first time. The German carmaker says that with manual coasting using the shift paddles, automatic coasting via the predictive efficiency assist and brake recuperation, the Audi e-tron is built for intelligent energy restoration. This allows the SUV to attain up to 30 per cent of its range through this process. Audi claims that the electric SUV recovers energy in two ways: by means of coasting recuperation when the driver releases the accelerator, or by means of braking recuperation when the brake pedal is depressed. 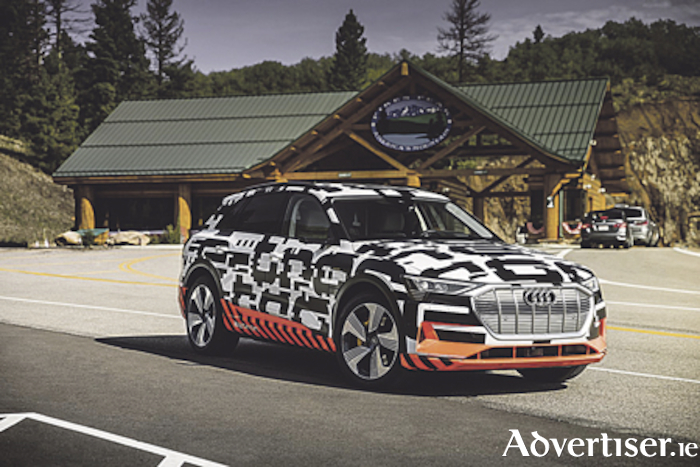 In both cases, it adds that the electric motors function as a generator and converts the kinetic energy of the Audi e-tron into electric energy. This allows the battery to recover energy in practically all normal braking maneuvers which Audi says makes the system the most efficient on the market. It says that if the brakes are applied at a speed of 100 km/h, for example, the Audi e-tron can recuperate electric power that corresponds to more than 70 per cent of its energy input. This claim would mean that the electric SUV comes close to the level of a Formula E racing car in the 2018/2019 season in terms of its efficiency. While driving downhill, Audi says that the e-tron can recover almost all the energy it generates by means of recuperation. And it adds that the electric SUV is capable of achieving long range distance even whilst driving in mountain ranges. The driver can adjust the degree of coasting recuperation via paddles on the steering wheel or select automatic mode in Audi’s MMI infotainment system. The Audi e-tron will go on sale from early 2019. Page generated in 0.0898 seconds.